Sobering word that outfielder Xavier Nady 22 is shelved with an appendectomy is accompanied today by the exciting news that prospect Lastings Milledge is in Flushing to take over while he’s gone (and maybe longer). Word is Milledge will dress in the reserved-for-African-American-sluggers No. 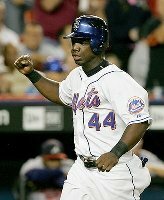 44 (and not 6, which is what we might have rooted for to bridge the homegrown power alley between Wright 5 and Reyes 7). We wish Nady the best for a speedy recovery and that young Mr. Milledge (we won’t ever get used to referring to him as Lastings, we don’t think) doesn’t wind up overwhelmed by the “can’t miss prospect” pressures felt by previous Met inhabitants of his uni — Jay Payton and Ryan Thompson. Once again, Steve Phillips went hard at the trading deadline, resulting in three new Mets. He sent Jay Payton 44, Mark Corey 27 and minor league slugger Robert Stratton to Colorado for righty starter John Thomson and utility outfielder Mark Little. Met press notes say Thomson will wear No. 50 and Little No. 21. Little’s number became available minutes earlier when the Mets sent Bobby Jones 21 and a few minor leaguers to San Diego for sidearming reliever Steve Reed. Reed will wear No. 39. (Thanks to Jason for the speedy update). Also, Satoru Komiyama 17 was sent to Norfolk (again, and probably, forever). Also on Wednesday, the Mets recalled Mike Bacsik 33, and welcomed Super Joe McEwing 47 back from the disabled list. After the game, Bacsik was sent back to Norfolk, along with Marco Scutaro 26, in order to make room for the new arrivals. 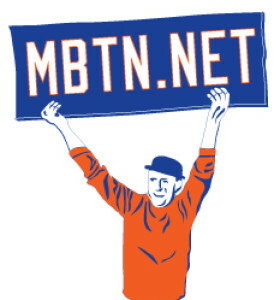 MBTN is back from a two-week break, during which we missed some moves, but not much fun. Here’s a quick chronological rundown. June 24: Optioned Dicky Gonzalez 39 to Norfolk; recalled Jerrod Riggan 38. June 25: Optioned Riggan; recalled Grant Roberts 36. June 26: Optioned Alex Escobar 25 to Norfolk; activated Jay Payton 44 from the DL. June 30: Designated Darryl Hamilton 18 for assignment (See ya! ); recalled Vance Wilson 3 from Norfolk. July 3: Activated Edgardo Alfonzo 13 from the DL; placed Jorge Velandia 11 on the DL. July 4: Activated Donne Wall 33 from the DL; optioned Roberts to Norfolk. Jay Payton’s freakish bad luck continued yesterday when a pulled hammy sent him to the disabled list. While No. 44 recovers, the Mets have called up Alex Escobar to take his place. Escobar, who will wear No. 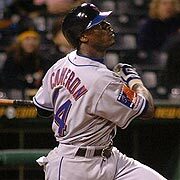 25, is perhaps the most highly touted Met outfield prospect since Darryl Strawberry donned No. 18 for the first time — 18 years ago this week!